I remember when throat hit was a big deal. My first vaping experience was with a high-nicotine cigalike device, and the punch it gave me at the back of my throat was one of the main things that convinced me that vaping could really fill the role of smoking in my life. 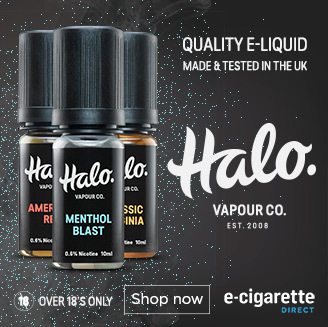 Yes, I enjoyed the vapour and the nicotine, but without that slightly irritating bite to the back of your throat on the inhale, my e-cig would have felt like a toy that could have never replaced the real thing. As masochistic as it sounds, I needed that harshness on the inhale to make the switch. If it was too pleasant, I’d have just gone back to smoking. The high-VG, low-nicotine juice I’m vaping right now would have never gotten me away from smoking. It’s more like the mellow, smooth feel of smoking a hookah pipe than the brutal, hot and harsh throat hit from a cigarette. The big difference, though, is that I now see this as a positive, not a negative. Many vapers seem to have a similar experience to mine. 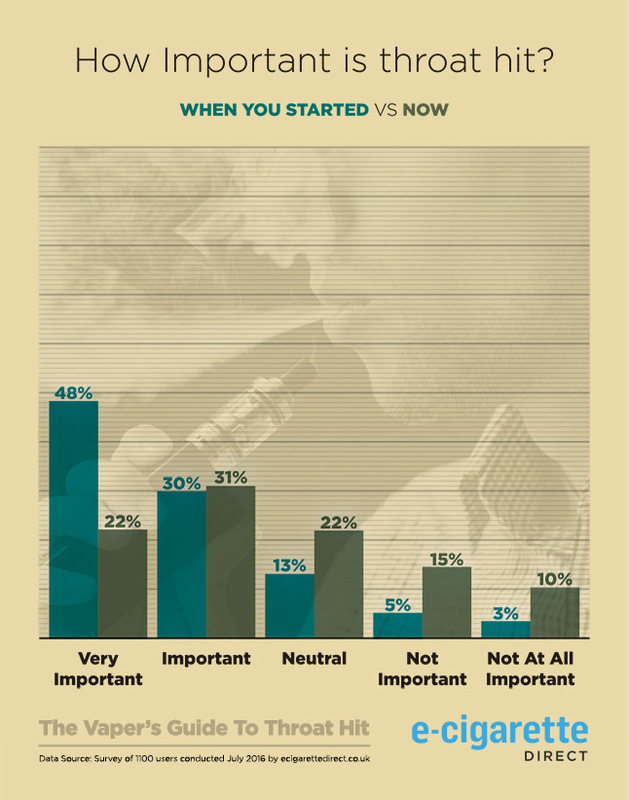 Working with PG/VG magazine, we surveyed more than 1,100 vapers and found that over three-quarters considered throat hit important or very important when they were first getting started. But when we asked them about their current views on throat hit, that number dropped to around half. Many of the responses said that clouds and flavour were the priority for them now, with throat hit taking a bit of a back seat since they quit smoking. However, the majority did still class throat hit as important. The good news is that you can have the best of both worlds. You don’t have to sacrifice flavour to get a satisfying kick at the back of your throat when you vape, and you don’t have to trade in the clouds for faint wisps of mist either. In the same way, you don’t have to become a high-VG e-liquid vaping cloud-chaser on a homoeopathically tiny dose of nicotine to get a smooth throat hit. All you need to do to tailor your throat hit to your preferences – whether you want it harsh or smooth – is learn the basics of what throat hit is, what creates it and how you can adjust your gear to suit your preferences. Before we get onto how you can tweak your throat hit to suit your preferences, you need to know what throat hit actually is. The “throat hit” from an e-cig is the feeling it gives you on the back of the throat as you inhale. A strong throat hit feels similar to a cigarette on the way down, quite irritating to the back of your throat and enough to make you cough if you’ve never done it before. A gentle or weak throat hit is when the vapour goes down smoothly, not causing much of a sensation on your throat as you inhale. It’s a lot less harsh to vape from setups that only give a weak throat hit. It isn’t really comparable to the feeling you get on your throat from smoking, unless you smoked really smooth cigarettes like Silk Cuts. 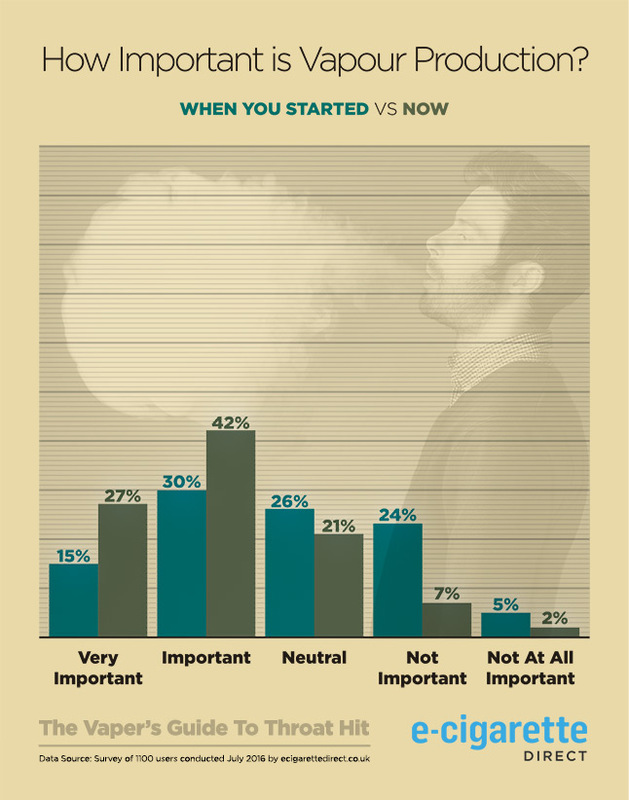 For vapers, tweaking your throat hit to suit your preferences is the main concern. How do you get a cigarette-like throat hit? What type of e-juice should you use if you want a smooth hit? Use a higher-nicotine juice. More nicotine equals more throat hit. Simple. Choose a higher-PG blend: If you have a sub ohm tank and mod, a roughly 50/50 PG/VG mix is good, for a basic tank system you should aim for a bit more PG than that. Increase the power or temperature: More power or a higher temperature will amplify your existing throat hit and add one of its own. Go with a menthol juice: Menthol boosts throat hit, so if it’s a priority, try out some menthol flavours. Citrus blends can work too. Decrease the airflow: Less airflow means a more concentrated, hotter vape, and that translates into a punchier throat hit. Use a different wick: Cotton has a lot going for it, but if you really can’t get a good enough hit, try a hemp wick to give your throat hit more of a bite. Decrease your nicotine strength: You might need to vape a bit more to feel satisfied, but lower nicotine strengths are better for a gentle throat hit. Use higher-VG liquids: VG is great for clouds, but the throat hit is really smooth at anything over 70 % VG. Reduce your power setting: Lower-power vaping keeps the vapour cool and the throat hit gentle. Choose a sweet flavour: Sweet, creamy or bakery e-juices offer a generally smooth throat hit. Coffees and tobaccos can have the same effect too. Open up your airflow: More airflow makes the vapour cooler and less concentrated, reducing throat hit. Stick with cotton wicks: Cotton offers a subtle throat hit, but it’s less than with other wicking materials. The amount of nicotine in your e-juice is the key thing that influences your throat hit. Nicotine gives a robust, punchy throat hit, and more nicotine gives a stronger throat hit. If you’ve ever vaped a high-nicotine e-juice you’ll know the feeling – it’s powerful and sometimes verges on uncomfortable, but if you’re just switching from smoking it could be just what you need to replicate the sensation of smoke. The advice is simple: if you want a bigger throat hit, get an e-liquid with more nicotine in it. If you want less throat hit, get an e-liquid with less nicotine in it. 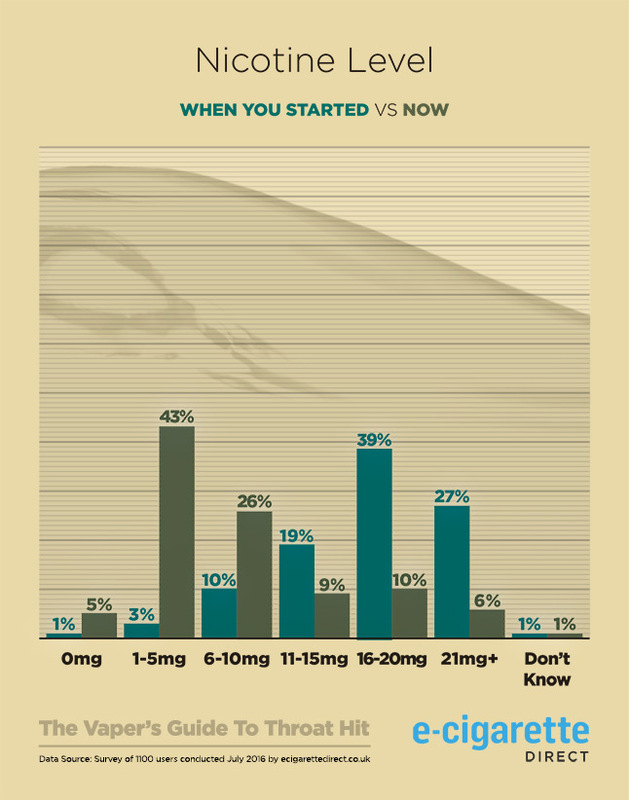 When we surveyed vapers about throat hit, just under half of the people who rated their throat hit as strong used a nicotine strength over 16 mg/ml. For people who rated their throat hit as weak, almost two-thirds used juices with 10 mg/ml of nicotine or lower. But there is one issue. When you start using things like sub ohm tanks and mods, your equipment gets more efficient at getting you nicotine, and higher nicotine strengths quickly become too much to handle. Most people then switch to a lower nicotine level like 6 mg/ml, but this notably reduces the throat hit from the nicotine. If you want a good throat hit with lower-nicotine juices, you’ll have to increase your throat hit using the other entries on the list to compensate. The opposite problem is if you need higher nicotine strengths to feel satisfied but can’t cope with the throat hit. This one isn’t so easy to solve, because nicotine provides most of the throat hit, but again, the other tips on this list will help you minimise it. 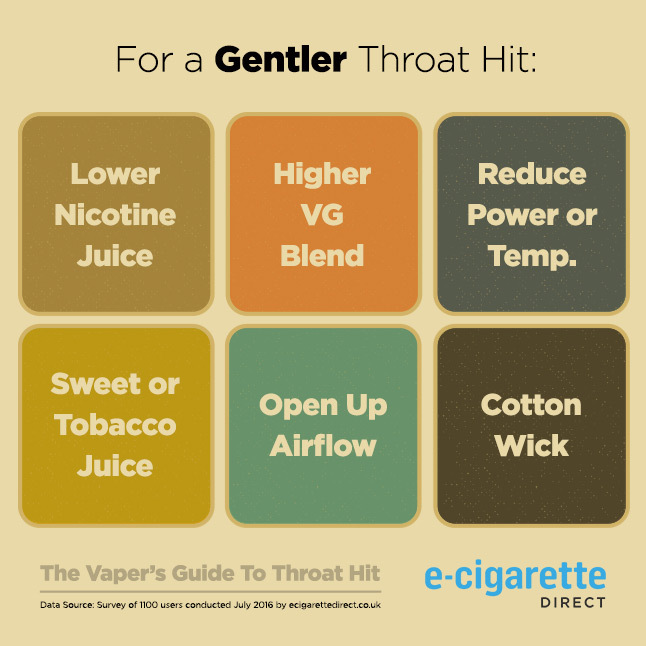 One piece of advice that’s useful for throat hit (and in general) is to buy your e-juice from companies that use pharmaceutical-grade nicotine. Cheaper nicotine can have a notably peppery quality, and the throat hit is much harsher than with the high-quality stuff. Another of the most well-known sources of throat hit is the PG/VG ratio of the e-juice you’re using. PG produces more of a throat hit than VG, with high-VG liquids being ideal for anybody looking for a smooth vape. The throat hit from PG isn’t as full-bodied and robust as that from nicotine, though. PG offers more of a sharp, biting hit to the back of your throat, and it can get slightly tickly or scratchy from time to time too. The nicotine gives a thick, robust baseline throat hit and the PG just makes it a little punchier. The results of our survey generally support this role of PG/VG ratio in your throat hit. People who rated their throat hit as strong or very strong were most likely to use a roughly even balance between PG and VG (between 40/60 PG/VG and 60/40), followed by high PG (over 60 % PG). 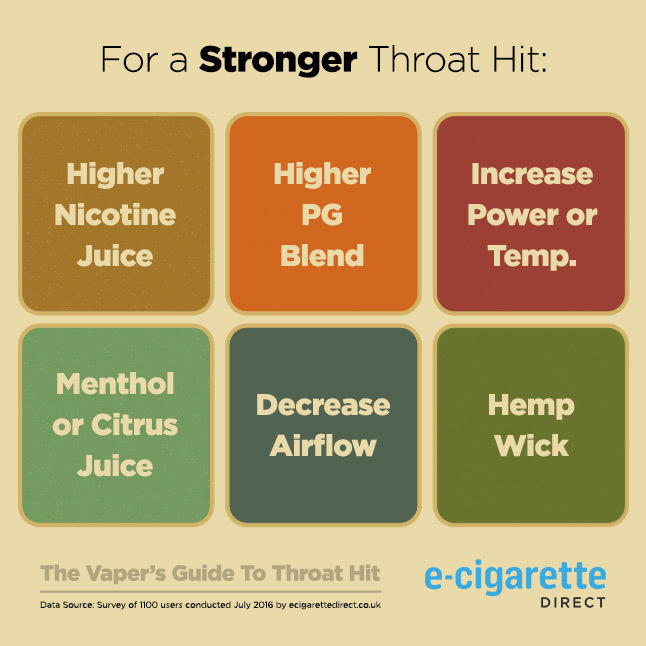 Conversely, 43 % of people who rated their throat hit as weak or very weak used high-VG (over 60 % VG) e-juice, with a mid-range e-juice being the next most common answer. So if you want to increase the throat hit from your e-juice, choose a blend with slightly more PG. However, too much PG can get a little unpleasant to vape. The tickly and scratchy element of the throat hit can get too much to put up with, especially if you have a mod and vape at high power levels. This is the reason a mid-range PG/VG ratio was the most common choice for vapers getting a strong throat hit, rather than a high-PG blend. This issue is even more likely if you suffer from PG sensitivity. This isn’t too common, but if you have the issue, PG will feel painfully scratchy on your throat and is much more likely to make you cough. In our survey, we asked vapers who’ve changed their opinion on throat hit what led to the change, and out of 385 responses, 17 (about 4.4 %) responded that PG was too irritating to their throat or made them cough too much. The other downside of higher-PG juices is that VG carries the vapour production. This means boosting your throat hit detracts a little from your clouds. This is another reason that a roughly even balance between PG and VG works well. However, if you do have PG sensitivity or just want a smoother throat hit, high-VG juices are the best choice. The power you vape at has a big impact on your throat hit, too. This is mainly a concern for people with variable wattage or temperature control (TC) mods, because smaller tank system e-cigs only support lower-wattage vaping. But with a powerhouse mod and a sub ohm tank or other atomizer that can cope with higher wattages, you open up a whole new area when it comes to throat hit. The throat hit from your power setting mainly comes through from the temperature of the vapour, and it’s been described as multiplying the effect of your existing sources of throat hit. So if you have a sharp throat hit from the PG content of your juice, turning the power up to 50 W will make it even sharper. Similarly, the warm, robust throat hit from nicotine gets a lot stronger when you turn up the power. 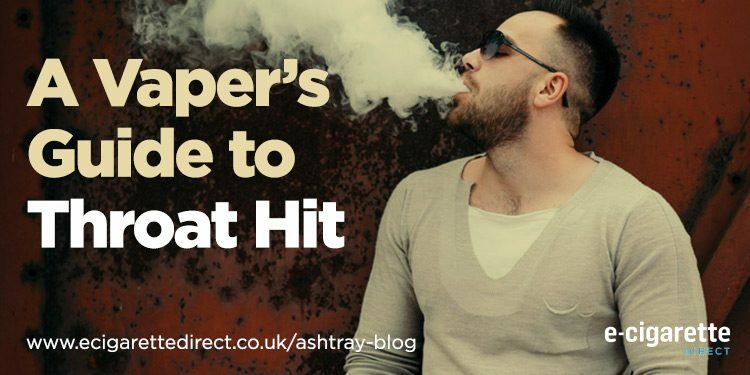 This is actually a big part of the reason most vapers decrease their nicotine level when they get a better setup – the throat hit can get a little much to handle. On the basis of this, it might seem like power isn’t a good thing to change to adjust your throat hit. Why would you want to make PG even scratchier on your throat? Why would you want an uncomfortably strong nicotine hit? Well, some people will be looking for a really strong throat hit like this, for one, but it’s true that most vapers won’t. The real benefit of power is that it allows you to get the most out of whatever throat hit your juice has. For example, a 30/70 PG/VG mix with 6 mg/ml of nicotine wouldn’t provide much of a throat hit at low powers, but if you pump the wattage up past 40 W or so, the punch of the nicotine and bite of the PG will increasingly carry through into the vapour. Also, if you want a smaller throat hit, variable wattage and temperature control devices are great, because you can easily decrease the power and get a smoother hit. The same advice carries over to TC mods too. When you get right down to it, the temperature of your coil is the key thing you’re affecting when you adjust the wattage, so if you have a TC mod, then you’ll be able to dial in the right throat hit even more easily. In the survey, there wasn’t a clear relationship between device choice and throat hit like there was for PG/VG ratio or nicotine. However, we asked the vapers about their first setup and their current one, and this gives some insight into how power impacts throat hit. When the vapers started, basic tank systems were the most commonly-used devices. At this point, the vapers who got a strong throat hit were more likely to use higher-PG and higher-nicotine e-juice, with 16 to 20 mg/ml being the most common choice. 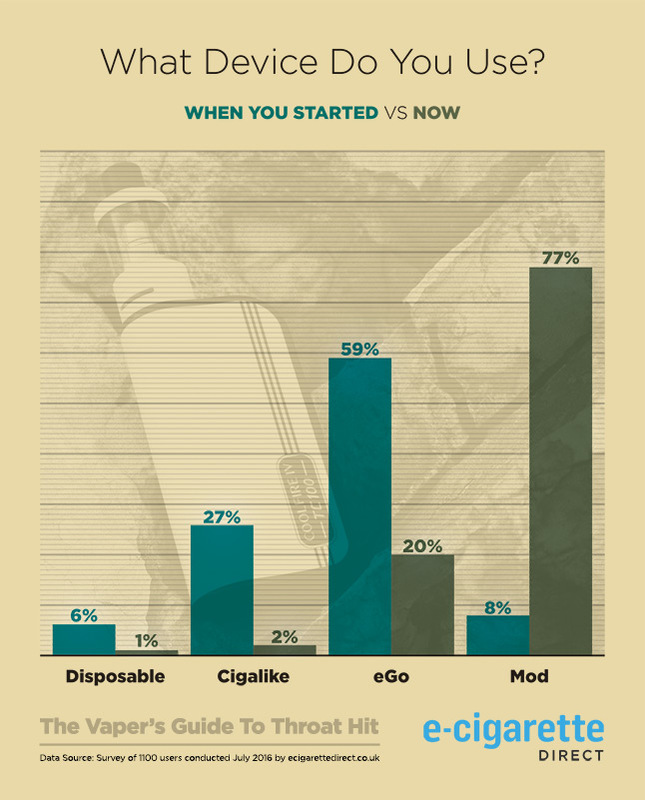 At the time of the survey, when mods were the most-used device, people who got a strong throat hit were most likely to use mid-range PG/VG ratios (with high-VG only slightly less common) and nicotine levels from 1 to 10 mg/ml. In other words, higher-power devices allow people to move away from really high nicotine levels and PG content while still getting a powerful throat hit. As you’d expect, too, the people who said they currently had a weak or very weak throat hit were most likely to use low-nicotine (between 1 and 5 mg/ml) and high-VG e-juice. 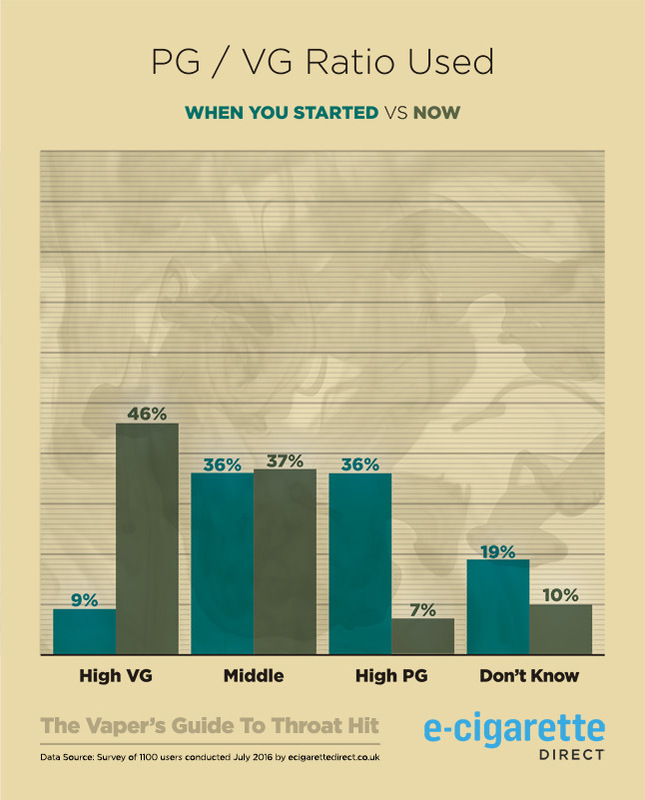 Most of your throat hit comes from the sources we’ve already covered, but there’s more to throat hit than power, nicotine and your PG/VG ratio. In fact, the flavour of your juice impacts your throat hit too, and each type of flavour has a distinctive quality of its own. Although each flavour has a “base” ingredient – usually PG – that carries some throat hit, the amount in your finished e-liquid is small, and the impact of the flavour itself is more important. To boost your throat hit, menthol is the best choice. Some vapers even add dashes of menthol to other flavours to get that extra cooling punch on the inhale. Citrus flavours have a similar effect too, though a little softer. If you want a much more subtle, gentle throat hit, darker flavours like coffee or tobacco, and sweeter options like fruit, cream and bakery flavours are the best choices. Sour fruits are an exception to this, though, because they add a touch of throat hit on the exhale. The only downside to this tip is that most vapers choose flavours for how they taste rather than the throat hit. So if you (like me) love sweet, heavier dessert flavours but still want a solid throat hit, there isn’t much you can do apart from tailor your throat hit based on the other entries in this post. Another minor source of throat hit is your airflow setting. This is another one to consider if you’ve made some bigger changes with your nicotine level, PG/VG ratio and power setting but you’re still not quite satisfied with the hit you’re getting. reduce your throat hit, and a tighter one will increase it. This is easy to understand if you think about what you’re doing when you open up your airflow. By allowing more air to be drawn in, you’re making the vapour less concentrated, and this reduces the impact on your throat. Conversely, tightening up the airflow keeps the vapour concentrated and gives you a more robust throat hit. This is especially true because tighter airflow tends to be vaped mouth-to-lung, which involves drawing the vapour into your mouth and then inhaling it all together. This is the same way you smoke a cigarette. Taking all the vapour back at once like this boosts the throat hit it gives you. If you open up your airflow and inhale “direct-to-lung,” though, you will still get a hit when you vape, it just isn’t as focused on your throat and strikes more on the exhale than the inhale. In our throat hit survey, the relationship between airflow setting and throat hit wasn’t clear-cut, but there was a link between open airflow and a weak throat hit. Out of the vapers who ranked their throat hit as weak or very weak, over half usually vaped with open airflow, and just over 16 % used a tight airflow. Of the vapers who said they had a strong throat hit with their setup, open airflow was still the most common choice (used by around 38 %), but about 30 % of them used a tighter airflow. Finally, your choice of wick can have an impact on your throat hit, but the dominance of cotton over other wick materials means this is something many vapers don’t notice. Cotton is widely-used because it wicks excellently and offers a very clean flavour, but when it comes to throat hit it doesn’t have much to offer. If you’re looking for a gentler throat hit, cotton is a great choice. For a harsher hit, if you have a rebuildable atomizer or a tank you can re-wick easily, hemp wicks can really beef up your throat hit. Many vapers find this unpleasantly harsh, but this is another thing to consider if the other choices you make about your setup don’t give you enough of a hit. For example, if you use VG-based e-liquid for the clouds and only low nicotine, but still want a throat hit, switching to a hemp wick could make all the difference. Silica also has a hit, but it’s a little sharp and uncomfortable, and flavour is generally worse from silica wicks. Things change fast in the world of vaping, and when we first wrote this post nicotine salts hadn’t even been invented! But they have now, and have revolutionised vaping for people who prefer stronger nicotine and softer throat hits. In a nutshell, nicotine salts are the original form of nicotine form in tobacco, and are not as harsh on the back of the throat. If you’d like more information check out our in-depth guide here, or check out some of the delicious nicotine salt flavours available here. What Type of Device is Best for Adjusting Your Throat Hit? Through the list above, you may have noticed that several of the options don’t apply to every device. For example, you can’t usually adjust the airflow setting on a basic tank system e-cig, and you can’t choose a different PG/VG ratio if you’re stuck with a cigalike from one specific company. Like so many things with vaping, the options really open up when you pick up a mod with variable wattage and (ideally) temperature control. 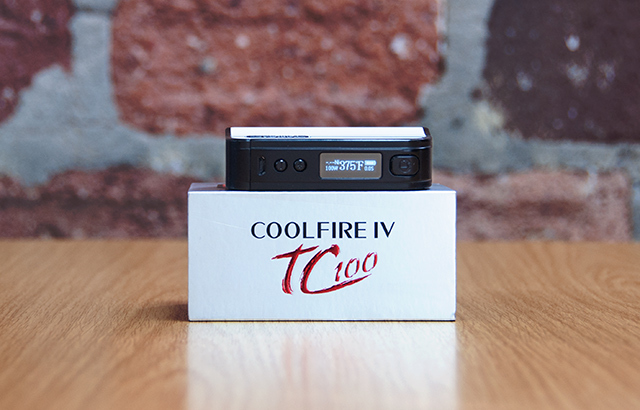 Pair something like the Innokin Coolfire IV TC100 with a sub ohm tank and you can use any juice you like (so you have control over your nicotine strength, PG/VG ratio and flavour), you’ll have control over your airflow and you can adjust the power or temperature to get the type of hit you’re looking for. If you don’t have a mod, then it’s still OK, but you’ll really need at least a tank system to make any meaningful adjustments to your throat hit. Upgrading to a mod is recommended if you want a better hit, though. In the continuing quest for better flavour and bigger clouds, throat hit seems to be taking a back seat for many vapers. But it shouldn’t. 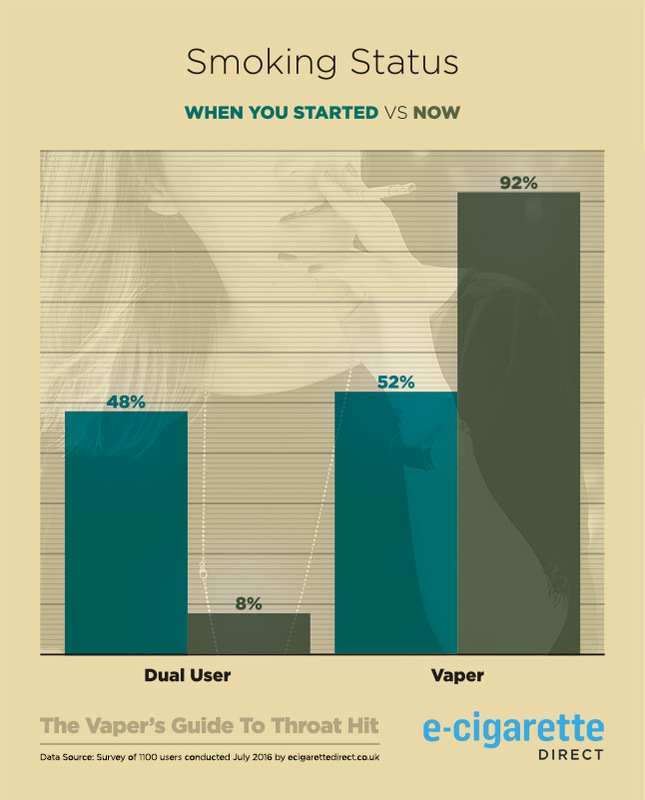 Not only is throat hit central to switching away from e-cigs for many, it’s also another dimension to the experience of vaping. You don’t have to choose the same type of punchy hit most of us were looking for when we started vaping, but thinking about how your setup and choice of juice affect your throat hit gives you yet another way to make you vaping experience perfectly-suited to your tastes. Thanks for your tips and advice lee.im currently trying to move from cigarettes to an ecig. playing about and tweaking my set up to try and fully make the transfer. i can’t stand throat hit. i used to be a menthol smoker, so i’m mostly looking for juices with cold (sometimes freezing), but fresh sensation. from what i can tell, mint and menthol flavors suppress/hides the throat hits. because when i compare juices with 3mg nic level, but one is creamy and the other is a menthol. the creamy one will give you noticeable (but smooth) throat hit. i’ve also compared juices from the same brand, both fruity, 3mg and has the same 70VG/30PG ratio. but one is non-menthol. the throat hit i got was quite harsh on the non-menthol. so i might add one more tips for people looking for a more gentle TH. go with a cool/minty juices. I’ve not found that – in my experience pure menthol flavours have a strong hit than the equivalent pg/vg & nic strength e-liquid. hi james. i think i might be wrong about the term “throat hit”. i was actually referring to the itching sensation in the throat. I’m new to tjis and went from a cigalike vype to a cool fire 4 to fine tune the the hit. At the moment I’m using a 6mg 50/50 red astair which is fruit and menthol and setting the mod at 12watts and reduced airflow. I now get a nice subtle throat hit but with a nice flavour. I recommend a mod as you can get the most enjoyment out of your liquid and adjust the power for different liquids. The cigalikes do a job but if you really want to get the most from your juice you have to have the ability to adjust the power and airflow. I’m trying to fin a recipe for 18mg nicotine, throat hit and loads of vapour, but not having much luck . Heeelp pleeeease ? Thank you for the post! I had an old SMOK 2 box (low wattage) and used 12-16mg nic. I recently upgraded to a monster of a mod… SMOK G-PRIV 2 Luxe edition with the V12 Prince tank and coils. What a difference high wattage makes. The guy at the shop set me up and warned me that the hit is going to be hard. He told me to drop down to 3 or 6mg of nic and I argued with him because I didn’t understand how powerful the neg ohm coils are. He set a tester up with 12mg and I nearly choked to death. lol. Lesson learned–I now use 6mg and still find it a bit throaty. He pointed me to your post and it all makes sense now. Thanks again! Vape on bro. I think I may be a bit different to the majority in that I am a heavy smoker of ‘lite’ cigarettes & am really struggling to transfer to vaping due to the harshness of the throat hit. I understand using the majority-VG liquid & the lowish nicotine tobacco eliquid & have two of the three holes open on the air-flow ring. The problem is I need to go below 10 watts and when I do it spits liquid and is really unpleasant. The vape ‘machine’ came with two coils – 1 for ‘normal’ vaping which I assume is my type and one that you can use for high voltage. Sorry I’m not very technical – do you think there is a coil that works below 10 watts or is there something else I can do to lessen the throat hit to just that you get from the nicotine? Breeze 2 or mi-pod are what helped me fight the same problem you are having. Vaping made me gag and choke with a higher powered vape. I went lower power and smaller draw with 18% nicotine or so and got a nice smooth draw similar to a light cigarette but the nicotine I needed being a heavy smoker like you. I just started using vape. I like the nicotine juice. My biggest question that people can’t seem to answer for me is will the smell if nicotine be on my clothes and in my house like a normal cigarette does. Great guide and easy to understand! I’ve been torturing myself with harsh throat hits for two weeks but after reading this guide, I can inhale for more than half a second, it’s great. Going from half a second to much longer takes me back to my teenage years. Thank you! If its too smooth it might be worth experimenting with an e-liquid with a higher pg ratio. Thanks. I have some 30/70 – will give that a try. Hi , I’ve just bought Vaporesso Cascade Oneplus SE. My concern is I’m having a lot of throat hit. Please suggest me how to reduce the throat hit. There is no option to change the wattage on this device. I get the throat hit even after using a 70vg liquid. Earlier I used to vape on Innokin MVP 2.0 and never experienced a throat hit. Apologies, Vinay, I’ve never used the Vaporesso! Great article. Thanks for your research and your time writing this! I have moved from my tank to a suorin air about a year ago and always had a smooth throat hit (my preference). It seems that now the throat hit is so harsh i am about to put vaping down for good… unless I figure out what has changed when I haven’t changed nic levels or ratios. I thought the new cartridges were all fake but I scanned and they’re not. Hate this knock-me-back-throat hit! Feels like one of the first cheap sticks that sold. Yuk! Do you have any insight for me? I’ve tried buying new suorin airs because I lose them a lot so are they possibly changing the device or cartridges somehow to cater to most ppl who want the harsh hit? Sorry to hear you are struggling with throat hit! I wonder if the VG:PG ratio has been changed in the cartridges? One problem with cartridges, at least pre-filled ones, is you have very litle control over the throat hit. I’d suggest using a refillable pod or cartridge system, and experimenting with either a higher VG ratio or a nicotine salt e-liquid for a smoother throat hit. Which Vape Kit Should You Buy?